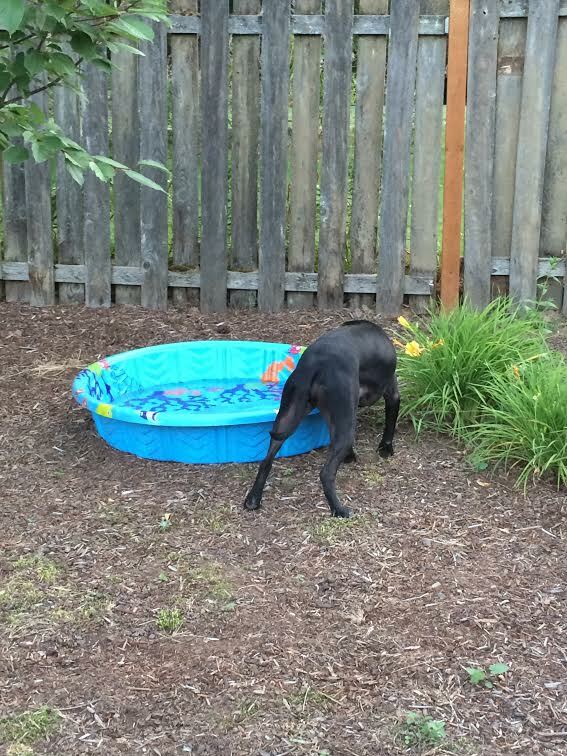 When the heat wave hit Portland (high 90’s) I decided I wanted to get one of those plastic kiddy pools for Bella. I searched everywhere and couldn’t find anything! I ended up going to 5 different stores and they were all sold out (or only had the inflatable pools that Bella would pop in one second). One evening I was driving home from work through Sellwood and spotted a pool outside a hardware store. I immediately pulled over and ended up buying the last pool they had! It BARELY fit in my car. I was so excited! I took it home and couldn’t wait for Bella to frolic in the pool and cool down. Yeah, I apparently just bought a giant water dish. That above photo is Bella drinking out of her pool. 😛 We keep trying to get her to play in it but she won’t. I don’t get it. It’s almost 100 degrees out and you’d think she’d love it. I sent a video of her drinking out of it to her foster mom, Jen. 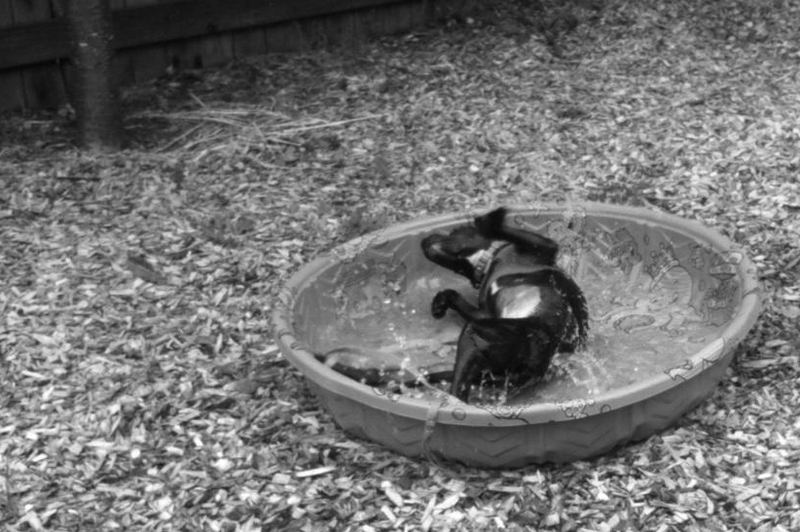 She promptly sent me a picture from last summer when Bella played in her pool! So I know she likes them, why won’t she get in our pool?!? Maybe by the end of summer she’ll be into the pool. Anyways, on to dinner. 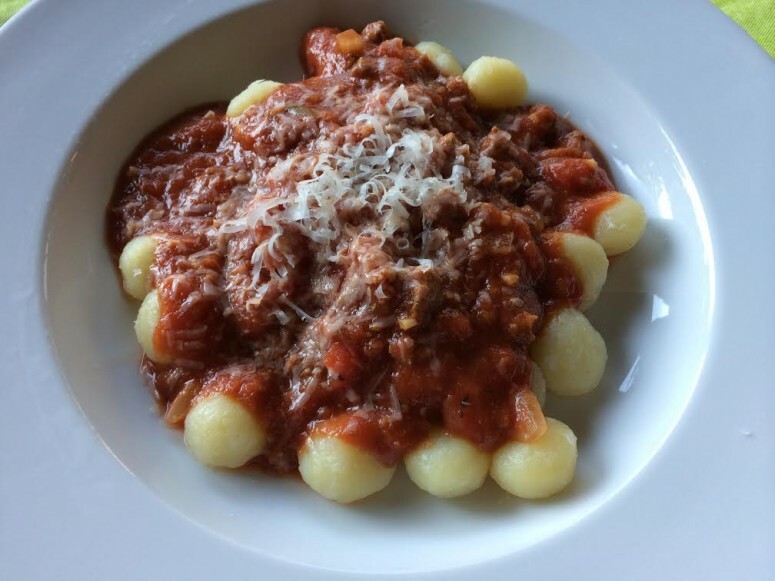 Despite it being a hot summer day and a cold salad or seafood would have been more appropriate, I was craving homemade marinara sauce and gnocchi. When I got home from work I started to simmer the sauce immediately. I added some fresh oregano and rosemary from my garden, too, with a splash of red wine. While the sauce was simmering, Michael and I took Bella for a long walk. It was stifling outside. In a large stockpot, saute garlic until soft and fragrant in 2 tbsp. of olive oil, about 2 minutes. Throw your meat in with the garlic and brown until meat has been thoroughly cooked through, about 5 minutes. Season with salt and pepper. Pour in the tomato paste, tomato puree, and seasoning, including the fresh basil. Stir to mix well. With the 6 oz. can from the tomato paste, fill that with water and pour it in the stockpot as well. Let mixture simmer, uncovered, for 2 or more hours (the longer the better, but minimum 2 hours), stirring occasionally. Serve hot over fresh pasta. While I liked the sauce a lot (it was thick and creamy), it could have used some more garlic and maybe some more salt. Other than that I enjoyed it. I made some gluten free spaghetti for Michael and I had gnocchi from Trader Joe’s (I love that stuff). 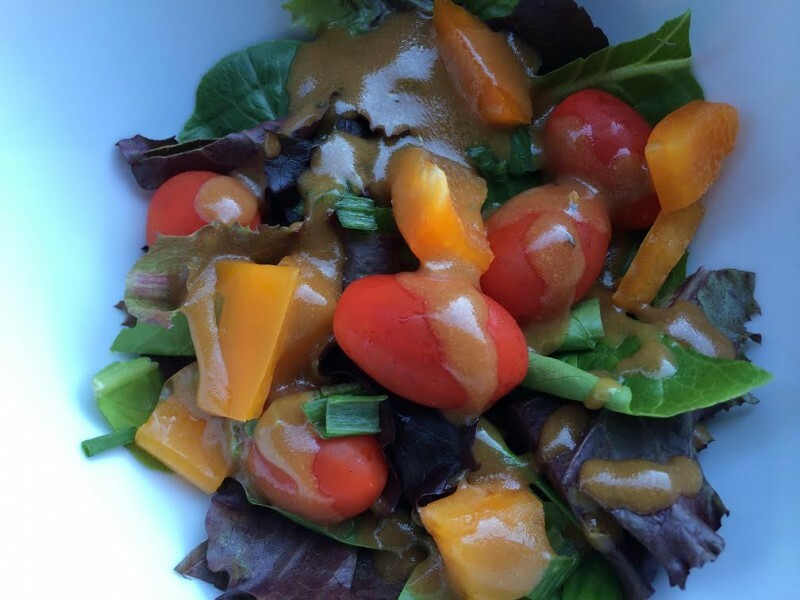 While everything was finishing up I made a salad and dressing from scratch. I know that’s not a big deal but I rarely make my own dressing and I really want to try and do this more often. It’s pretty easy and you can make it any way you want, really. 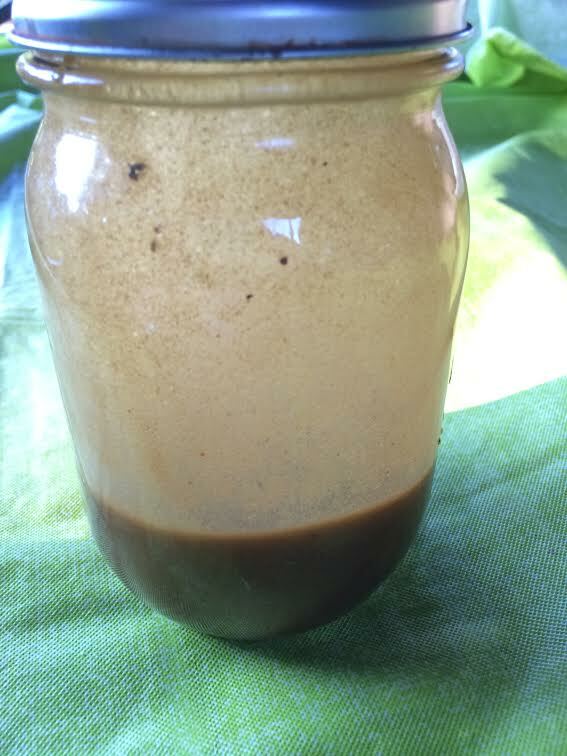 Combine all ingredients in a tightly closed bottle and shake thoroughly. Shake before each use. Salad was greens, grape tomatoes and orange peppers. I loved the dressing. It was mild and delicious. I’m definitely going to experiment with more homemade dressings. I found a few that sounded really good on Pinterest using Greek yogurt as a base. Dinner was served! I topped the sauce with some freshly grated Parmesan cheese. I love gnocchi. I’m not a huge pasta eater but gnocchi is fantastic! 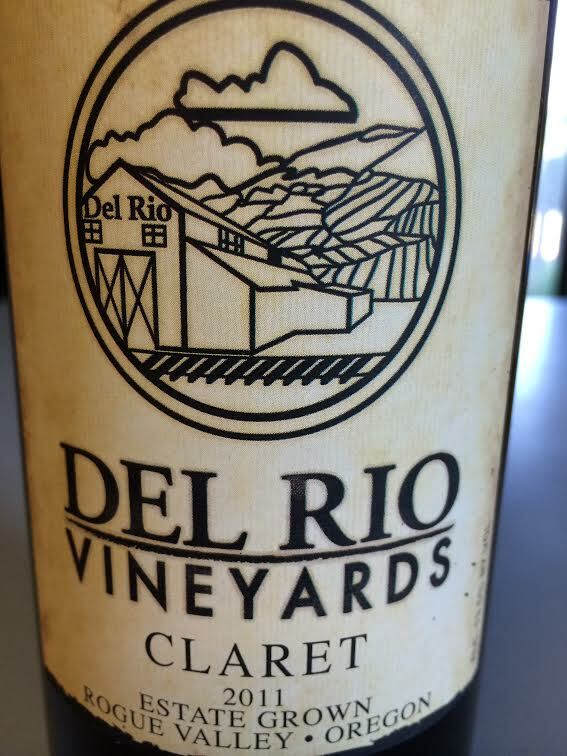 (One of these days I will try and make my own…) I opened a bottle of Claret wine to go with dinner and it a nice combination. What is your favorite spaghetti sauce recipe? My favorite pasta sauce is SO EASY – it was internet-famous for a while so you might know it. It’s Marcella Hazan’s four-ingredient effortless sauce. Thank you for sharing that link. I have not seen the recipe before but it sounds simple. Interesting how they did the onions! smashed smoooshed tomatoes and done. CARLA recently posted..Does closing comments turn blogging into lecturing? Bella looked like she was having a lot of fun. And that recipe… Yum! She always has fun. One happy pup!